I am totally a dip lover, I could easily eat it everyday. I am always excited when I find a new tasty one. I made this dip for the 4th of July and it knocked my socks off. It was so darn good. There were only 4 of us and we seriously almost ate the whole dish. I had saved this recipe out of one of my old Southern Living Magazines. I swear Southern Living never disappoints with their recipes. My picture isn't quite as pretty as Southern Living's but I can assure you it tasted fabulous. 1. Preheat oven to 375°. Cook diced onion and next 2 ingredients in a large skillet over medium-high heat, stirring often, 8 to 10 minutes or until meat crumbles and is no longer pink. Drain. Stir in garlic and thyme; cook 1 minute. Stir in wine; cook 2 minutes or until liquid has almost completely evaporated. 2. Add cream cheese, and cook, stirring constantly, 2 minutes or until cream cheese is melted. Stir in spinach and salt, and cook, stirring constantly, 2 minutes or until spinach is wilted. Gently stir in beans. Pour mixture into a 2-qt. baking dish; sprinkle with Parmesan cheese. 3. Bake at 375° for 18 to 20 minutes or until golden brown. Serve with corn chip scoops, bell pepper strips, and pretzel rods. I am very much a dip person and this looks so good! Can't wait to try it! Yumm. Looks delish and I am always looking for a new dip, too. My job today is to go through all of my food magazines and tear out recipes I want to keep. Same for my decor magazines. I hate getting rid of stuff like that! If I didn't, I would be packing boxes of magazines and I don't think Bryan would be very happy! o god sounds deadly and yet so yummy! I hope they sell your cookbook at Borders!! I need that right now. So hungry, looks so yummy! oh my, I'm printing this out now!!! YUM!!! yum! will definitely be trying this soon! YUM-O!!! This dip looks delicious! Yummy!!! Dips are my favorite food ever too - you always post such great recipes!! Despite what you say, your picture looks pretty good too. 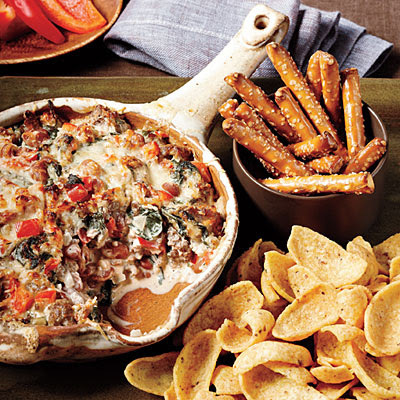 Sausage + dip= yummy! Oh la la! I never pass up a chip dip recipe...thanks for passing along. That looks and sounds horribly delicious! Thanks for testing it out! Sounds yummy! I'll add that to my "must make" list! Dang how good does this sound! I definitely need to make it!